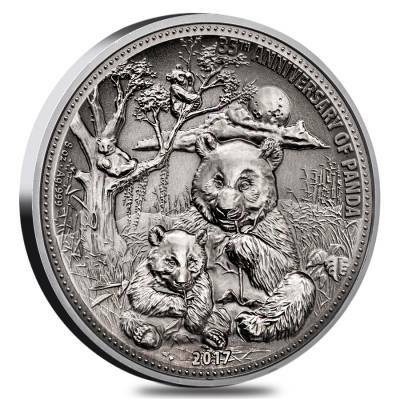 This outstanding 2017 8 oz Silver Panda Fiji $5 Coin is an exclusive release available at Bullion Exchanges. This coin honors the 35th anniversary since the first Gold Panda coin issued in 1982. This outstanding coin release has a limited mintage of 888 pieces worldwide, making it highly collectible on the marketplace. The coin weight of 8 oz represents the “Lucky number eight” in Chinese culture. The number is associated with prosperity, success and high social status, raising the demand among businessmen and passionate numismatics. 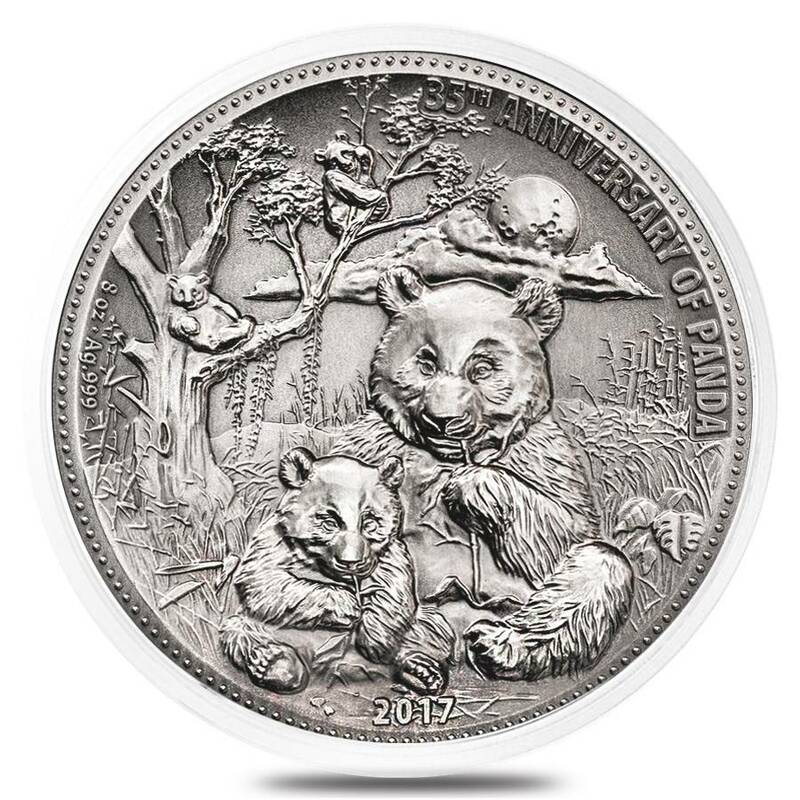 The coin’s obverse features a few playful panda bears, two of them are sitting down on the front side and eating a bamboo branch from their hands with a bamboo forest in the background. The two other cute panda bears are engraved on a forest background, sitting on the tree. 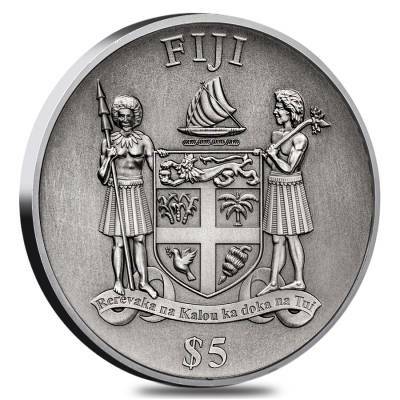 The coin’s reverse depicts Fiji’s Coat of Arms granted on July 4, 1908. The elements that appear in the coat of arms represent Fiji's primary production and is linked with both its colonial and pre-colonial past. The national motto "Rerevaka na Kalou ka doka na Tui" (“Fear God and honor the Queen”) is placed below the Coat of Arms. The artwork is completed with the inscriptions: “FIJI” and the denomination. This remarkable silver coin minted with an antique finish via the latest production techniques, has an impressive coin diameter of 70 mm, presenting every detail of the coin stunningly. Coin comes with an amazing green wooden box colored as a bamboo tree. This unique and exclusive coin would be a perfect addition to any precious metals portfolio. The coin made from .999 fine silver with a weight of 8 troy ounces. Exclusive coin from Bullion Exchanges. Face value - $5 FJD. 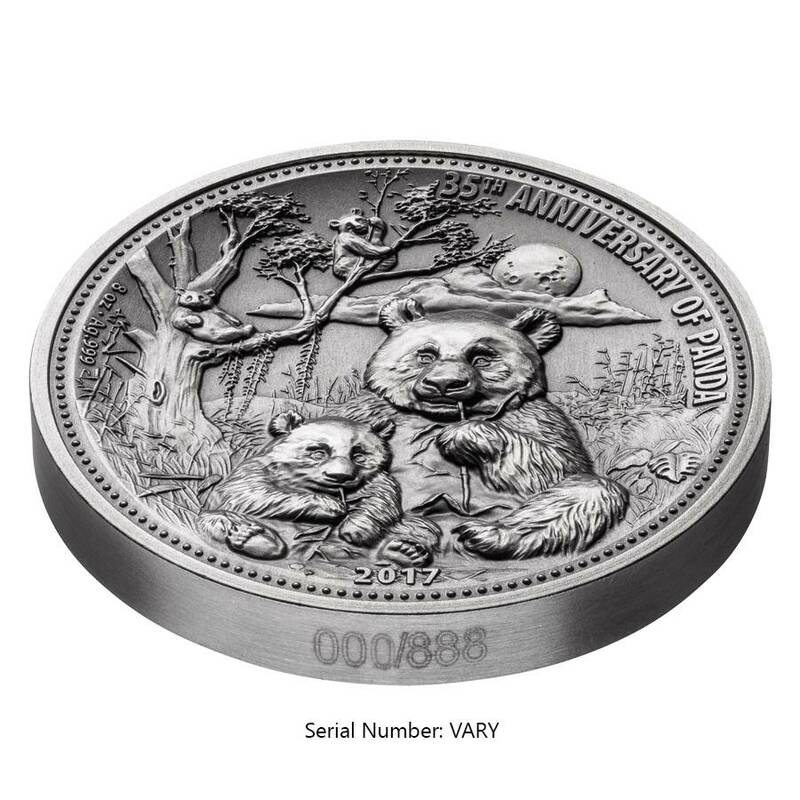 Limited mintage of 888 pieces only. Special antique finish, serial # can be found on the edge. This is a high relief coin - this unique effect makes the image rises higher than the edge of the coin. Coin diameter - 70 mm, Coin thickness - 8.6 mm. 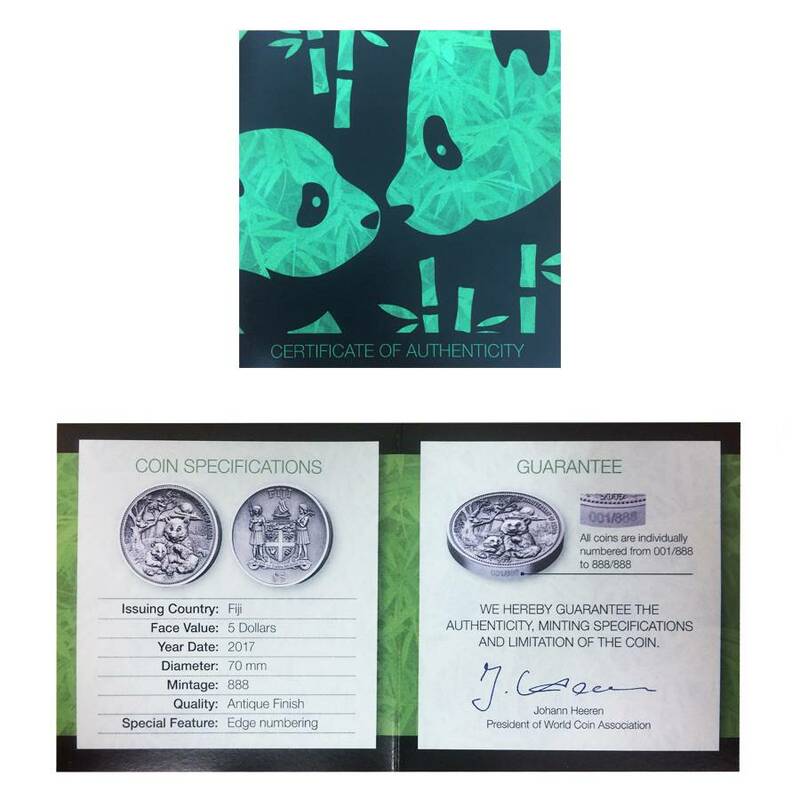 35th anniversary of the first Chinese Panda coin issued in 1982. The individual coin is encapsulated and housed in a premium wooden box colored as a bamboo tree and accompanied by the Certificate of Authenticity. 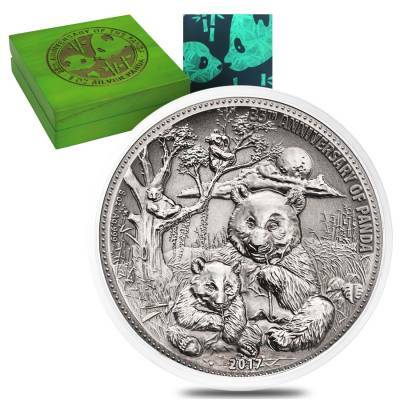 Obverse: Showcases a few panda bears sitting down and eating the bamboo branch from its hands. The two cute panda bears are engraved on a bamboo forest background, encircled by the weight, purity, year of mintage and "35th ANNIVERSARY OF PANDA" inscriptions. Reverse: Fiji’s Coat of Arms, the national motto "Rerevaka na Kalou ka doka na Tui" (“Fear God and honor the Queen”) is placed below. The artwork is completed with the inscriptions: “FIJI” and the denomination. Here, at Bullion Exchanges, we are proud to give you the opportunity to own one-of-the kind silver bullion coins of the highest quality. Don’t miss a chance and choose this fantastic coin by clicking on ‘Add to cart’ and you will get it delicately wrapped, packaged and delivered to you in no time. For any questions, write us a message or call us at 800.852.6884, we will happily assist you. Get this wonderful 2017 8 oz Silver Panda Fiji $5 Coin today! I'm a huge fan of unique and exclusive products. Amazing artwork! Great artwork! Love it. At least something the design is not boring. Bullion Exchanges is my #1 precious metals dealer. With this purchase, you earn 278 Bullionaire Bucks 278 BB = $0.28. We currently have 96 of this item in stock. For every $1 spend, you will earn 1 Bullionaire Buck which is equivalent to $0.001 off a future purchase. 278 BB = $0.28.